Spanish Sherry? Order Sherry from Andalusia Spain quickly and safely! Sherry is a Spanish fortified wine that is brought up by the solera system. Sherry comes from the region of Jerez de la Frontera in the extreme south of Andalusia. Only wine from this region may call itself sherry. Sherry is the English corruption of Jerez. 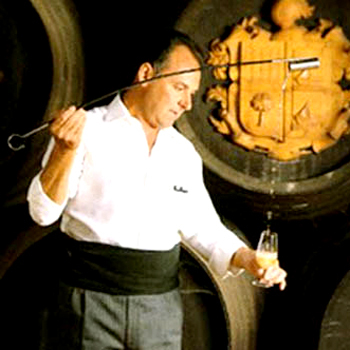 Le Connaisseur sells sherries from Lustau, Perez Baquero, Osborne, Sandeman en Bodegas Robles. When ordering your wine at Le Connaisseur, you can count on solid advice. Want to know more about a sherry or a winery? Then we will be happy to help you find an appropriate wine. And if you made your choice, you can easily order.